We hope to see you at our 10th Annual Blueberry Festival on Saturday, August 4. There will be food, vendors, music, children’s activities, a silent auction, and more… and blueberries of course! 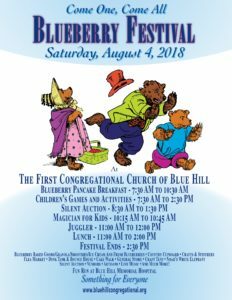 For more information and a schedule of events, please visit our Blueberry Festival page, or click here to see highlights from this year’s Silent Auction.